The Ramey Air Force Base covered 3,796 acres in the northwest corner of Puerto Rico, near the town of Aguadilla. Construction started in 1937-38, and the base was finally closed in 1973. 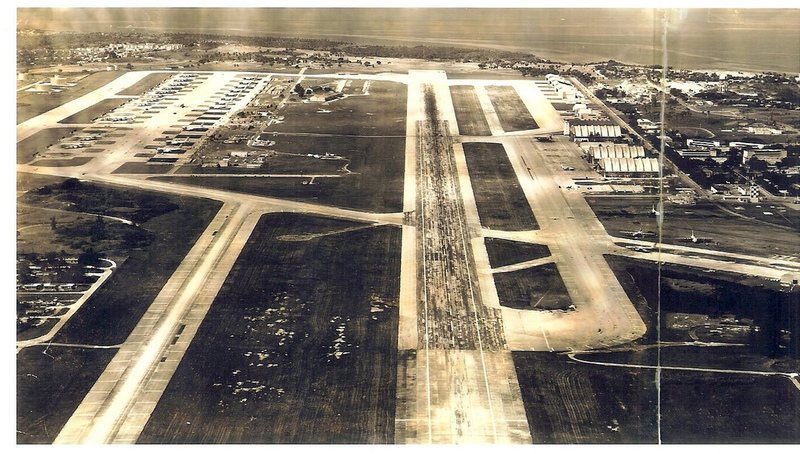 For 35 years it was a Strategic Air Command (SAC) bomber base. 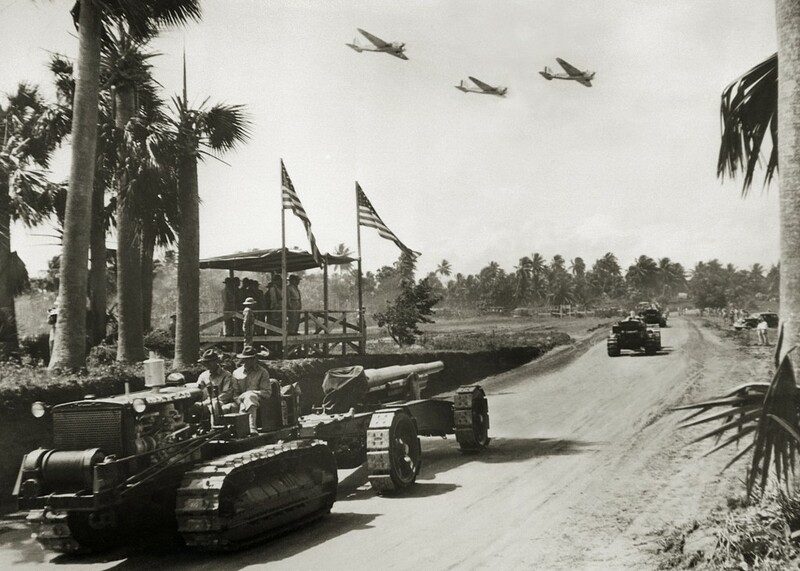 It housed the 55th Strategic Reconnaissance Wing with a two-mile runway, seventeen airplane hangars, and servicemen’s barracks. The base had its own elementary and high schools, hospital, officer’s club, swimming pool, and golf course. Ramey also housed a number of B-36 Peacemaker intercontinental bombers and KC-135 Stratotanker aerial refueling aircraft. Due to the size and weight of the B-36, the runway was large: 11,702 feet long and 200 feet wide, with an 870-foot “blast pad” at each end. Throughout the Cold War era, and especially after the Cuban Revolution of 1959, Ramey was the staging ground for numerous clandestine military interdictions throughout Latin America. During the Cuban Missile Crisis of 1962, Ramey Air Base was placed on the highest possible alert. The base was de-activated in 1973, and converted into the Rafael Hernandez International Airport: a low-key facility with roughly 50 commercial flights per week. Benicio Del Toro, Jennifer Lopez, Marc Anthony and other “celebrities” use Rafael Hernandez Airport to visit Puerto Rico on a low-key basis, and recreate themselves in the Rincón area of the island. A nostalgic Ramey web site, with many historic photos, is maintained by the Ramey Air Force Base Historical Association. As an American from Puerto Rican Ancestor’s I feel that we need to protect every shore we have these days especially with the opening of Cuban residents are now being allowed to request Visa’s to enter the United States. It seems that this is an open venue for terrorist to have a new Avenue/Venue to enter the USA. The Cuban Government is not to be truly trusted since they made their own people suffer for so many years. They in the past have done any type of tourism to Europeans for the interest of money since their own economy didn’t ever work with the Communist Idealism that the government fooled fool so they could take power. Ask any respectable Cuban who fled and has become a US citizen and had family that they supported while trying to live in a FREE country call USA!! Ask the Puerto Ricans who have had to depend on the Government to get the US to help supplement to help Puerto Ricans who have live ALL THEIR LIVES and depend on the Government to give them a stipend to survive the high cost of living in Puerto Rico. All the companies that employed so many people on the Island abandoned the island so the can go to other countries and pay some person at times children a minimum of a $1.00 an hour. No Puerto Rico is in such big problems with the Bonds sold from the PR Government that will be affecting the citizens living on the island with out being with Electricity and Water. What INTELLIGENT department allowed this to happen? As far as I’m concern their only chance that’s if the US decides to bail PR for their negligence is to allow this base stay and once again become active. It could probably bring in some jobs from the civil community. Food for thought people who fee that PR should be strictly on it’s own, explain who else is PR going to survive without the help of the US. Has anyone but any thought that all Puerto Ricans are US CITIZENS? Not needing to get a visa to come to the states not to mention yes our economy is not in a good status but who is in a better situation than us? I remember “Ramey Base” …. It’s in beautiful Aguadilla! “Throughout the Cold War era, and especially after the Cuban Revolution of 1959, Ramey was the staging ground for numerous clandestine military interdictions throughout Latin America.” ….. deactivated now!